Nassyam Basha is a database administrator. He has about 10 years of IT experience, with the last eight years as a production Oracle DBA. He currently works as a senior principal consultant at Data Intensity. He is a post-graduate who has a master’s degree in computer applications from the University of Madras. He started working with dBase and FoxPr and has participated in several projects with FoxPro and Oracle Database starting from Oracle 7. 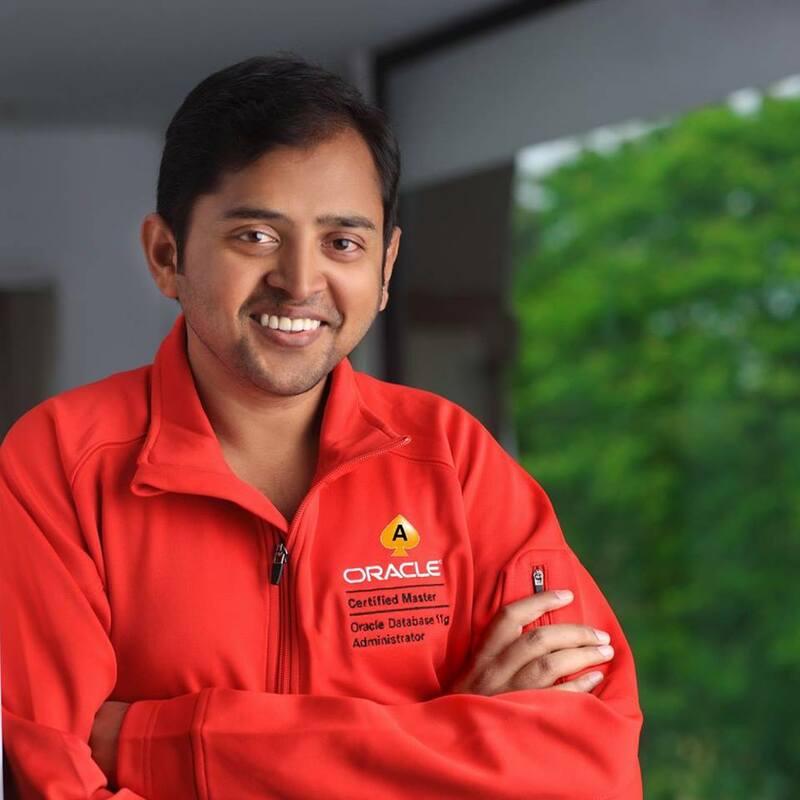 He is an Oracle 11g Certified Master and was awarded the Oracle ACE Director title from Oracle. He is skilled with Oracle technologies such as Data Guard, RMAN, RAC, Cloud Control, and performance tuning. He has completed hundreds of Data Guard setups with major Data Guard–related issues on all platforms and has worked with business-critical production databases. He actively participates in Oracle-related forums such as OTN with a status of Super Hero, participates in Oracle Support with the title of Guru, and acts as an OTN moderator. He also has written numerous articles for OTN and Toad World with the status of Master, Legend, Guru, and Celebrity. He maintains an Oracle technology–related blog (www.oracle-ckpt.com) and is reachable at nassyambasha@gmail.com. Participated in Customer advisory board, Community usability testings. Speaker across India(OTN Yathra, AIOUG Chapters, SANGAM) and including TROUG – Turkey, OUGF – Finland, IOUG. Book Authoring is always a biggest dream for any techie and this was never easy until i complete chapters of my first book. 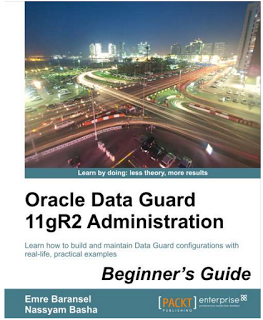 I have co-authored my first book “Oracle 11gR2 Data Guard administrator’s Guide” with Emre Baransel. I have enjoyed throughout the period and the actual excitement was when the book is completed and released. If someone who wants to learn Data Guard technologies with detailed demos in step by step and this is the perfect book. This book was well received and great response from the readers. 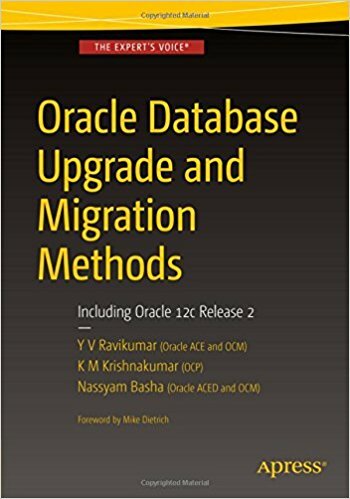 After my first book i took much time and again accepted to Co-Author on “Oracle Database Upgrade and Migration Methods” with KM Krishna Kumar & YV Ravi Kumar. When new versions or releases of the databases are available then in order to fix current bugs and to use new features customer always prefer to upgrade and this book specifically explained what are the various methods available to upgrade and migrate, used various other Oracle features/Products such as Data Guard, Oracle Golden Gate so on and test cases prepared with RAC too. Finally we have covered a chapter of all together 12c Release 2 new features related to the upgrade part. This book is released on 2nd March 2017 and available to download from Apress Amazon. Please share the feedback and write an quick review if something you want to mention about this book. Acting as OTN Moderator to review and ensure to take care of the Abuse, SPAM posts or wrong space posts.